Home > Listen to the Birds! Part One. A good observing session with Mopra is all about listening for the sounds of Australian birds to tell you what the telescope is up to and whether your input is needed. Not only can we follow the status of the telescope on our monitor, known as TOAD, the Telescope Operator Alerting Display, we can also listen for warning sounds telling us what is going on and whether our input is needed. TOAD – the amazing Mopra monitoring display, written by chief guru Balt Indermuehle. This tells you status of the observation and of the key telescope systems. 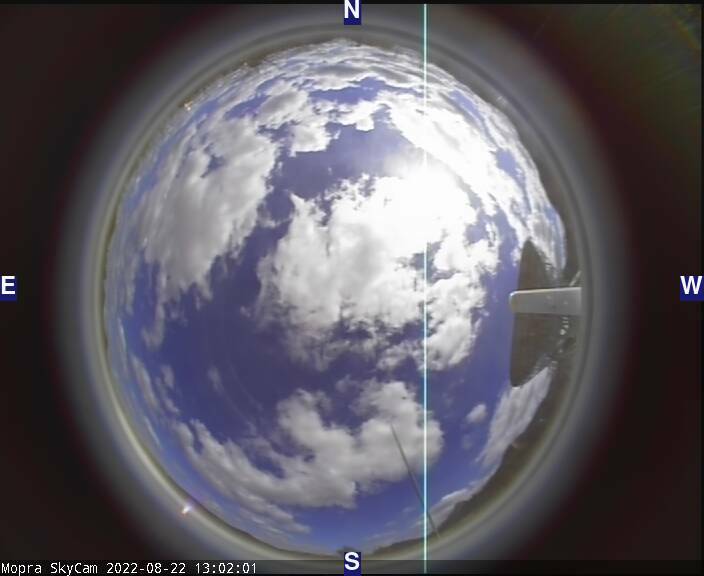 The all sky view to lower right shows the telescope as well as the sky – good for keeping a watch on the weather. On the top right can be seen the buttons controlling the sounds. Mopra actually has two separate audio warning systems. One comes with TOAD itself, and has warning sounds based on Star Trek alarms. Certainly good for waking you up if you have fallen asleep on a long night with the telescope, but the loud klaxon red alert sound is a little trying if listened to for long. Mopra also has a series of more peaceful sounds alerts directly connected to the Mopra operating computer, based on the songs of Australian birds. Nasty, raucous sounds, such as made by parrots, when something goes wrong. Quite, peaceful sounds when all is well. Listen below to the sound of the Whip Bird. Always very pleasant to hear with Mopra as it marks the end of a successful scan across a source, whilst making a map. It means all is well and the telescope is moving to the next scan position. The end of an observation (called a “schedule”) is marked by the sound of the chatter of magpies. Enough to wake you up from a doze and tell you to set up the next source. But not enough to alarm one. Much less welcome is when you hear the raucous sound of the sulphur-crested cockatoo. While it may be a spectacular bird to look out, its screeching call is enough to alert you to the fact that something is wrong and you’d better find out what pronto! Listen to TOAD one night and learn the sounds of the Australian bush!